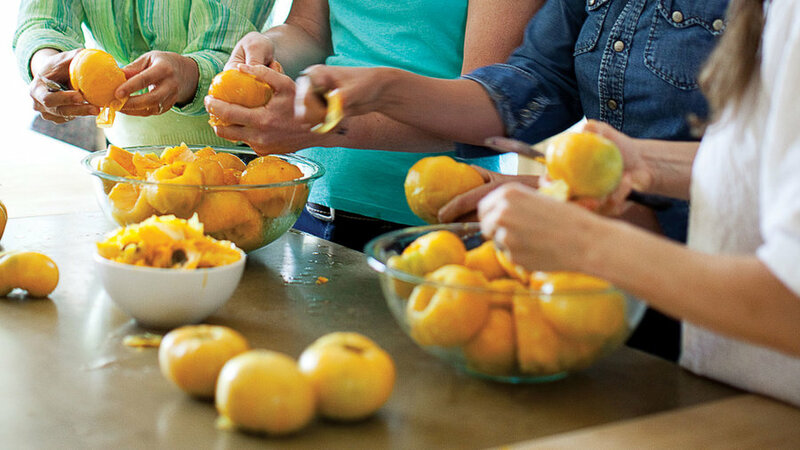 If you want to eat locally ― and eat well ― year-round, can your own fresh fruit and vegetables. 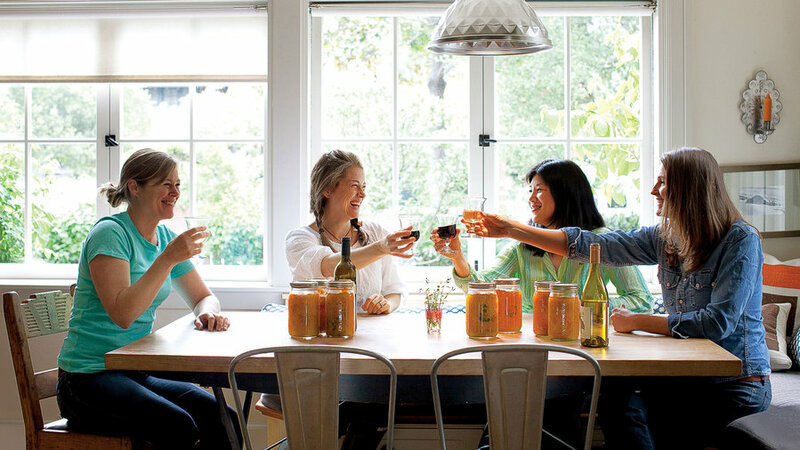 That’s what Kelli Glazier of Palo Alto, California, and her book club decided they’d do last summer after reading Animal, Vegetable, Miracle by Barbara Kingsolver, inspired by the author’s account of preserving the glut of tomatoes and other summer produce from her farm. 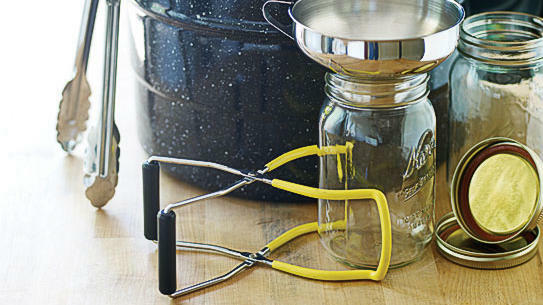 1 Gather equipment: canning jars with matching metal lids and rings, a boiling-water canner with rack, a widemouthed funnel, tongs, and a jar lifter. Most hardware stores carry these basics. 2 Fill canner with water and heat it up. 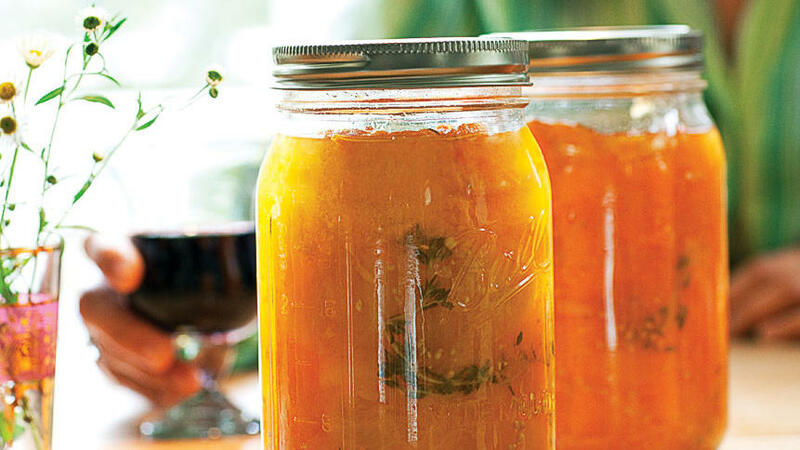 The canner should be two-thirds full for pint and half-pint jars; half-full for quart jars. Set rack on pan rim and cover pan. Over high heat, bring water to a boil (180° to 185° for pickles); this takes 30 to 45 minutes. 3 Meanwhile, wash canning jars and rings in a dishwasher and hand-wash lids; drain. 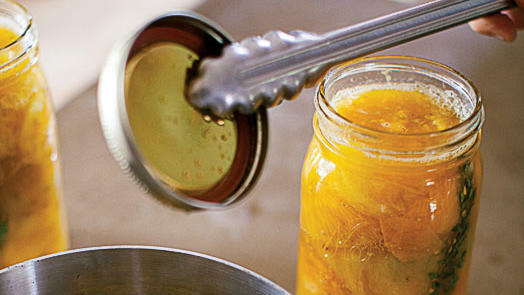 For jam only, sterilize the washed jars too: When water in canner boils, place jars on rack, lower into water, and boil for 10 minutes. 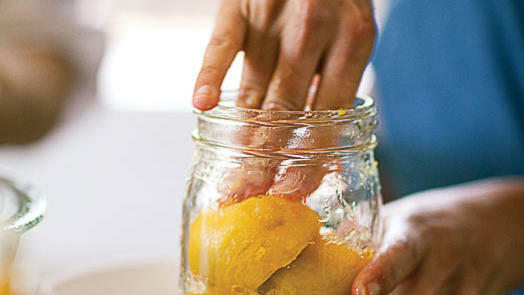 Reduce heat to a simmer and keep jars in water until needed. 4 Follow manufacturer's directions for preparing lids and bands. Here, we've nestled them together and heated them in water to cover until small bubbles form. 5 Rinse produce, then prepare as recipe directs. 1 Ladle foods into jars through a wide funnel or arrange with clean fingers, leaving the headspace (the distance between jar rim and food) specified by the recipe. If the last jar isn’t completely full, let cool, then serve or chill; do not process. 2 Release air bubbles in chunky mixtures: Gently run a plastic knife around inside of jars. Wipe jar rims and threads with a clean, damp cloth so that lids will seal. 3 Center lids on jars so the sealing compound on lids touches jar rims. Screw metal rings on firmly, but don’t force. 1 Lower jars on rack into water. The water should cover jars by at least 1 in. ; add hot water as needed during processing. Cover canner and return water to a boil. Cook for time specified in recipe. 2 Lift rack with jars onto edge of canner, using tongs and a hot pad. Using jar lifter, transfer jars to towels on a work surface. Don’t tighten rings. Cool completely at room temperature. You may hear a “ping” as jars form a seal. 3 Press on the center of each lid. If it stays down, the jar is sealed. If it pops up, it isn’t (you can still eat the food ― chill it as if it were leftovers). Label jars and store in a cool, dark place up to 2 years for best quality. Well-Preserved (Clarkson Potter, 2009; $30) by Eugenia Bone. A beautifully written guide to preserving small batches of fruits and vegetables (and even meats), written especially for readers with small kitchens and limited time. Plus, Bone includes recipes that show you how to use what you’ve canned. 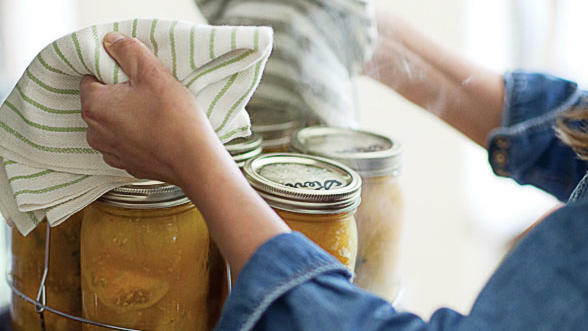 National Center for Home Food Preservation All the USDA canning guidelines on one handy site. Ball Complete Book of Home Preserving (Robert Rose, 2006; $23) by Judi Kingry and Lauren Devine. 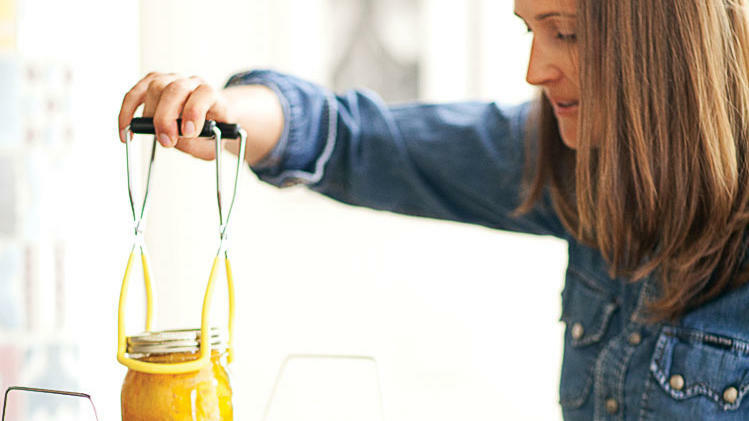 Sound advice and 400 recipes from the company that makes the jars. Follow directions and use only tested recipes. Do both of these things and you won’t need to worry about botulism; all our recipes are high-acid enough to kill any bacteria. Can foods that taste much better in season than out of season, such as tomatoes. Focus on one food per day ― say, beans for pickling, or berries for jam. Make large amounts so you get a good payoff for your time (our recipes each make a lot). Don’t double the recipes For reliable results, stick to the amounts given. 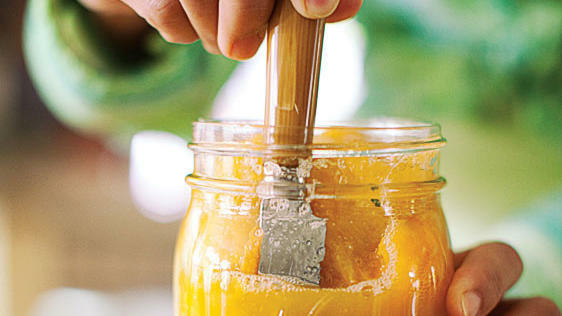 If you want to make two batches, start the second while the first is in the canner.